Teahupo’o, Tahiti on Monday 17th August was a day of high drama and upsets played out at the Billabong Pro Tahiti. Competition ran through the opening 8 Heats of Round 3 in fun three-to-five foot surf at Teahupo’o before being called off as conditions became inconsistent with the hide tide. A stacked match-up between reigning WSL Champion and defending event winner Gabriel Medina (BRA) and Hawaiian phenom John John Florence (HAW) unfolded in Round 3 Heat 5. With four previous man-on-man heats and two wins apiece the pair looked evenly matched. Medina took an early advantage and looked comfortable and in control in the barreling surf, earning a 9.07 on his fourth ride. Florence looked out of rhythm until he found a clean barrel and finished with a snap for a 9.57 and the lead. He found another deep barrel shortly after for back-to-back nine-point rides. Medina answered with two more tube rides of his own, needing a 9.58, and earning a 9.27 and a heat-high 9.73 for the lead. The Hawaiian was left searching for a 9.44 and is eliminated from the competition in 13th place. 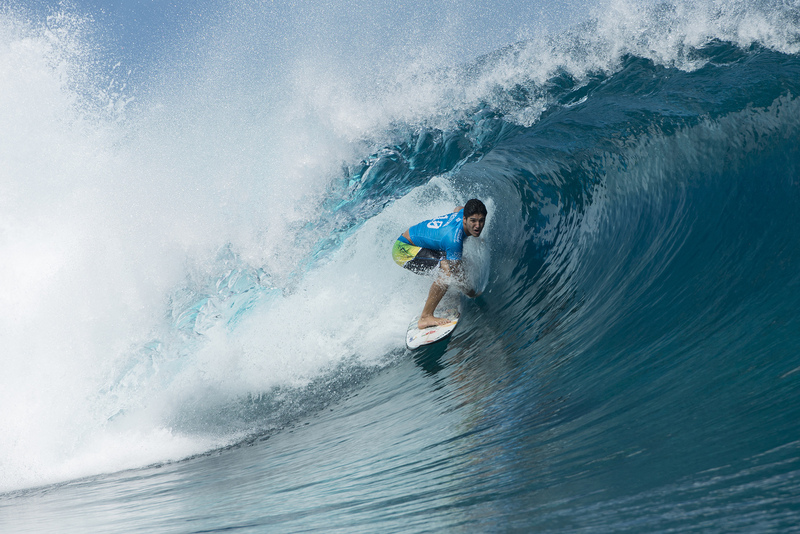 Florence finished equal 13th in the Billabong Pro Tahiti after being defeated in Round 3. Adriano de Souza (BRA) faced wildcard and 2008 event winner Bruno Santos (BRA) in an exciting all-Brazilian match-up. De Souza was looking for a strong result in Tahiti to solidify his position as Jeep rankings leader but couldn’t find the back-up score he needed to overcome Santos’ 16.20 heat total and is eliminated in 13th place. De Souza’s upset defeat and early exit leaves the door open for the next four surfers on the rankings to claim the top spot. Santos advanced in to Round 4 of Billabong Pro Tahiti in Teahupoo after defeating current WSL Jeep Leaderboard ratings leader Adriano de Souza. Replacement surfer and former CT competitor Aritz Aranburu (ESP) took down three-time WSL Champion Mick Fanning (AUS) in wave-starved Round 3 Heat 7. The wildcard got to work early and posted a two-wave total of 15.17 while Fanning had only 6.67 as the clock wound down. A strong result for Fanning in Tahiti would have given him the opportunity to steal the Jeep leader jersey from De Souza, but defeat at the hands of the Aranburu sees him eliminated in equal 13th place. After three attempts and three falls Brazilian Filipe Toledo (BRA) seemed to find his feet in the opening heat of Round 3. Current No. 4 on the Jeep Leaderboard went on to find three barrels with a clean exit to build a 16.97 heat total and take the win over Brett Simpson (USA). Simpson, who is currently at 36th place on the rankings and in need of a series of strong results to re-qualify for 2016, is eliminated in equal 13th place while Toledo heads to Round 4. Toledo winning his Round 3 heat with a pair of excellence scoring rides. Two nine-point rides from Owen Wright (AUS) gave him a decisive win over Dusty Payne (HAW) in Round 3 Heat 3. The Australian, who is currently in fifth place on the Jeep Leaderboard, looked in sync with the ocean, finding the best waves and dominating the lineup. Payne meanwhile, at 35th on the rankings, goes home with a disappointing place 13th despite a great performance and a strong heat total of his own. Wright winning his Round 3 heat with a near perfect 9-point ride to advance into Round 4. Kai Otton (AUS) along with Brazilian rookies Italo Ferreira (BRA) and Wiggolly Dantas (BRA) also won through their Round 3 heats to advance to Round 4. When competition resumes, up first will be Josh Kerr (AUS) and Adrian Buchan (AUS) in Heat 9 of Round 3.